The Tigris are a range of beautifully crafted, shiny triple tube water features consisting of 3 water tubes of different heights. The Tigris water features are constructed from timeless stainless steel with a mirror polished finish. Bubbling water exits at the top of each tube and gently shimmers down the stainless steel tubes, producing a stunning effect. These water features are ideal for indoor and outdoor use and lend themselves perfectly to installation in ponds or freestanding on a lawn or patio with the use of a suitable water reservoir such as the Finia 1000. The 3 tubes are joined at the base via a manifold and mounting plates which allow the feature to be fixed securely to a weighted mount or reservoir grid. The Tigris features come supplied complete with a 230 volt water pump with 10 metre mains connecting cable. Stainless steel features look particularly impressive when illuminated at night. The AquaLED range of coloured spot lights are perfect for intense up lighting of the stainless steel tubes. 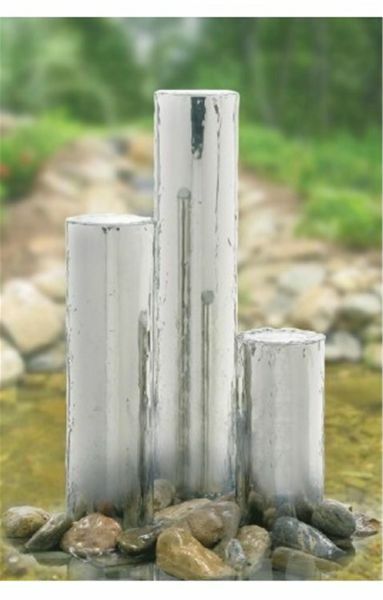 This Tigris water feature has tubes of 168mm diameter. The 3 stainless steel tubes measure 400mm, 800mm and 1150mm tall. Tigris Water Features - Dimensions and Tube Heights.